I’m Not DEAD: I’m Alive without a body (Volume 2) - What happens AFTER we die? This is Volume 2, of the ‘I’m Not Dead: I’m Alive without a body!’ series, which charts the next 8 years in the ‘diary’ of Suzanne’s life… in the Afterlife! Her words are written down exactly as they were received– being ‘channelled’ by her daughter the medium Brigitte Rix. Brigitte communicates mediumistically via the extra sensory perceptions of clairaudience, as well as automatic writing. 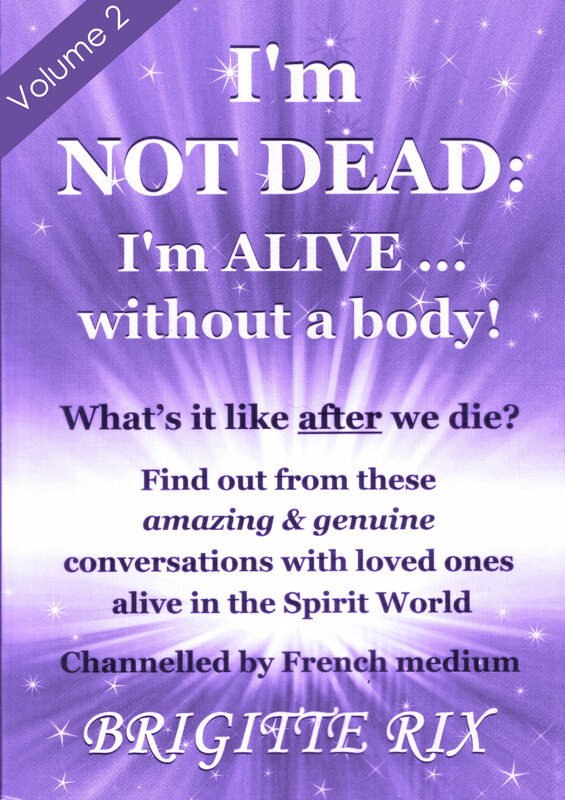 These are authentic, enlightening and heart-warming private conversations, between Brigitte and her mum, other family members, and her ‘Spirit Guide’, who are all now living on in the Afterlife. How we have many ‘past’ lives and choose the purpose of our life plans. How Suzanne welcomed her son after his suicide, and helped him overcome his death. Their investigations into the layers of the Mind to unfold their Higher Self. How Brigitte’s late husband Dave received his brother Ray, who passed over later. Dave’s ‘travels’ around the Earth world, to visit places he had never been to, when alive. How children are taken care of in the Spirit World, after their passing. The special powers of animals. Genuine ‘Physical Séances’ and Ectoplasm. Mind-boggling Materialisation and Dematerialisation of solid objects (the passage of matter	through matter). Coma; Suicide; Organ Transplants; Spiritual & Shamanic Healing. Why human scientists will not find or ‘create Life’. How Brigitte’s ‘fatal fall’ was averted by Spirit Guide and helpers. Alex: a real case of reincarnation – unexpectedly revealed! This book offers you upliftment, knowledge and reassurance that our dear ‘departed’ actually live on–and we shall meet again those we love! These Spirit ‘authors’ were real people on Earth, and their old personalities still shines through, as distinctly individual and very genuine, as they reply spontaneously to Brigitte’s questions, expressing emotions of joy, love and humour! They show us that life can be even greater, AFTER we ‘die’!